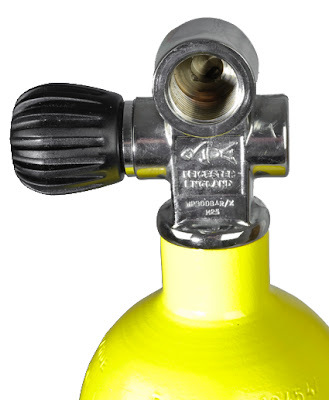 I took a couple of diver's scuba tanks - which I use for filling my precharged pneumatic air rifles - into the dive centre this morning... and found out something that I never knew. One needed to be sent away for a full hydrostatic test; the other was still 'in date' and could be filled there and then. As many PCP owners will know, if you fill up from an air bottle, for that scuba tank to be itself filled with breathing air by a diving centre, it must be 'in test'. But this is where things get complicated. Surface-use-only valves only need to be tested every five years (a full, hydrostatic test). Those bottle with valves which could be used underwater for diving - regardless of whether they are or not - need to be tested every two-and-a-half years. The tests alternate between a visual and a hydrostatic test. How to tell which type of valve you have? 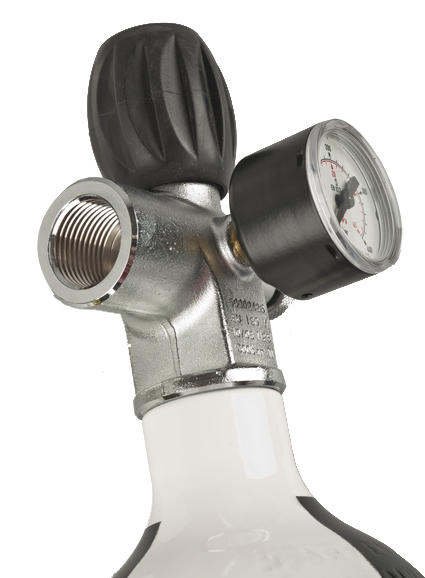 Well, if your tank has a gauge pre-fitted to the valve - like this slow-flow 'Jubilee' valve from MDE (below) - it's 'surface-use-only and requires a full hydrostatic test every five years. However, if it has not got an integral gauge fitted, like the one below, then even if you tell the diving centre that you've never taken it underwater, they will still treat it as a below-surface valve and, as such, the bottle to which it's attached will need to be tested every two-and-a-half years - visual, hydro, visual, hydro... and so on. But here's the thing I learned from my dive centre this morning. If you have a bottle with a below-surface valve, make sure you get it into the dive centre pretty close to its test date when it's due for the visual test - because if you leave it too long after, the dive centre will probably want to give it a full hydrostatic test. This, of course, costs around twice as much! I learned the hard way. Although my bottle was technically due a two-and-a-half year visual, because I'd left it almost a year - as it was full at 'clockover' date, and because it's only my 3-litre 'emergency' bottle which I rarely use, I'd had no cause to take it in to the dive centre - I got thumped with a £42 bill instead of a £25 bill! So... I just thought I'd pass this info on. Check your scuba bottle's test expiry date - either etched in the bottle, or on a sticker - and don't leave it too long afterwards before you decide to take it to your dive centre for its scheduled test! Requalification (HYDROTESTING) not required per the note under table 1 in 49CFR part 180.205. The note reads, "Any cylinder not exceeding two (2) inches in outside diameter and less than two (2) feet in length is exempt from volumetric expansion testing."